HOW CAN I CALL AN AMBULANCE IN JAMAICA? The number 110 can be accessed from any phone and will connect you to the fire department’s main dispatch in Kingston. Once the dispatcher has ascertained your location, they will relay your call to the nearest fire station and/or ambulance station. According to the Jamaican Fire Brigade’s website, each fire, police and ambulance station has their own phone numbers. 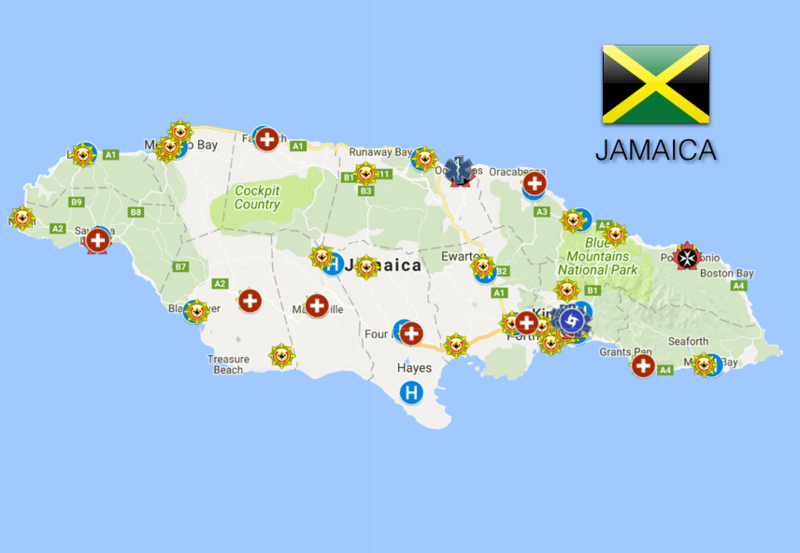 EDITOR’S NOTE: It is unclear whether the Jamaican Red Cross is actively involved in prehospital emergency care; their locations have been included in our EMS coverage map for reference. Transport via helicopter can be arranged through the Jamaica Defence Force. See map at top of page for list of public and private healthcare facilities in Jamaica. Yellow Fever – “There is no risk of yellow fever in Jamaica. The government of Jamaica requires proof of yellow fever vaccination only if you are arriving from a country with risk of yellow fever. This does not include the US.” See full list here.